Spring has finally arrived and as you sit on your porch or patio, the buzzing and chewing sounds of the carpenter bees working high up in the fascia boards dominate the quiet evening! Every spring brings the return of these large solitary bees. Every year they bore perfectly round, 3/8 inch holes into exposed wood surfaces, leaving piles of freshly chewed wood. Carpenter bees and carpenter ants are a major threat to the integrity of wood structures around the world. Although neither actually eats the wood like other wood borers such as termites, both can cause structural damage if they are left to carve out their nests. The female carpenter bee will choose an area of exposed wood that is generally un-painted and in an area that is protected from the rain. She bores a hole straight into the wood and then makes a 90-degree turn to the right or left for 6-8 inches. She eventually will lay several eggs in the tunnels that she has created. Each egg is in a little chamber which she fills with pollen and then builds a wall before laying another egg. This pollen will feed the larva until it pupates and becomes an adult bee. The male hovers outside of the hole guarding it from predators. The male may dive-bomb a person when they get too close to the hole, but the males cannot sting. Most activity is in the late spring. Often times, woodpeckers will cause the majority of the damage to the wood as they seek out the bee larvae. It is best to treat early before the female starts chewing the wood to avoid damage. 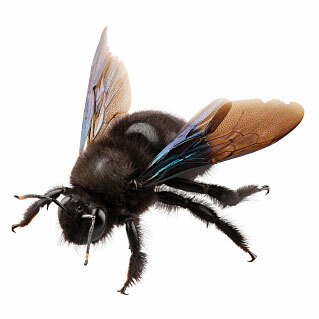 In the New England area carpenter bees start damaging wood in May.